Did You Know? Bats do not "carry" rabies; in fact, only about one-half of one percent of bats contract the disease. More people die annually from rabies transmitted by domestic pets than have died from contact with bats in all of recorded history! 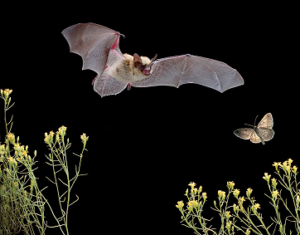 Learn more about these mysterious animals during Bats in your Backyard, a free program Feb. 1 at 7 p.m. at the Markham Woods Church of Seventh-day Adventists meeting room, 505 Markham Woods Road, Longwood, FL 32779, sponsored by Friends of the Wekiva River. Come and learn about these prolific mosquito eaters from Shari Blissett-Clark, President of the Florida Bat Conservancy. www.floridabats.org A bat hike will follow on Feb. 9 at 6 p.m. Meet at Lower Wekiva River Preserve State Park, 8300 W. State Road 46 Sanford, FL 32771. The presence of bats, however, isn’t guaranteed! For more information, contact FriendsWekivaRiver@gmail.com or call 407-415-0705.